What a delight to share the weaving experience with a friend! Two of these hot pads were woven by friends with no prior weaving experience. Miniature rag rugs make great hot pads, and provide a perfect learning experience for a guest weaver. Tenth hot pad, woven on 12/9 cotton warp. Fabric strips, previously cut for rag rugs, are used for the weft. 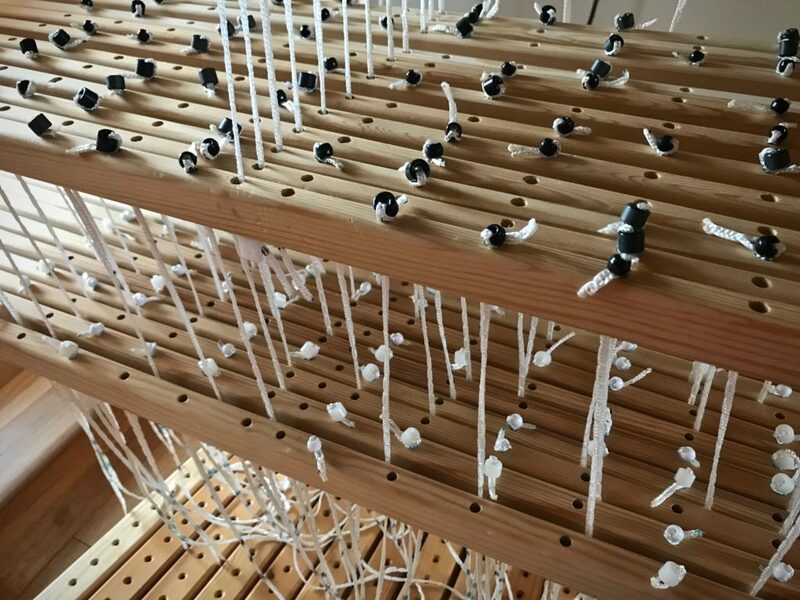 Ten hot pads are cut from the loom. Ten hot pads ready for finishing. Ends are tied in overhand knots and trimmed. Ready to be used! I hope you are finding opportunities to share your joys with friends. The Christmas season reminds us that we have someone greater who shared His joy with us. He stays by our side, waiting for any call for help, but allows us to make the mistakes that teach us life lessons. As with weaving, every error can be forgiven. There is a remedy for any hopeless situation. Take courage, God is a rescuer. He sent Jesus on a mission to rescue us. And absolutely nothing can stop the mission of God. I am amazed at what he can do with the threads of a willing soul. Joy to the world, the Lord has come. Let earth receive her King. May you share your joy. Merry Christmas, Karen! Thank you for sharing your beautiful work! Merry Christmas, Beth! It’s a pleasure to share. Hello, I love these hot pads but have a question (I’m new to weaving): what are the little white cloth strips on the corners of these pads and what did you do to them – they aren’t in the finished pictures? Hi Lindy, Great question! The white you see is the scrap weft header. 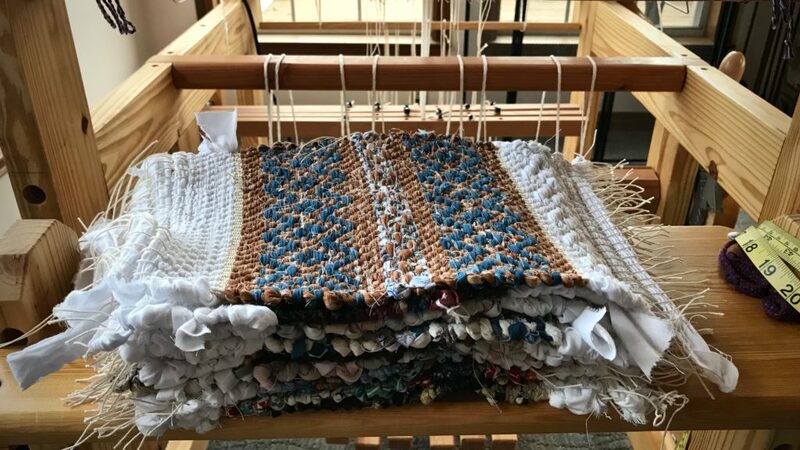 I weave two or three inches with throw-away fabric strips (mostly from old worn-out bedsheets) before and after every rag rug, or mini rag rag. 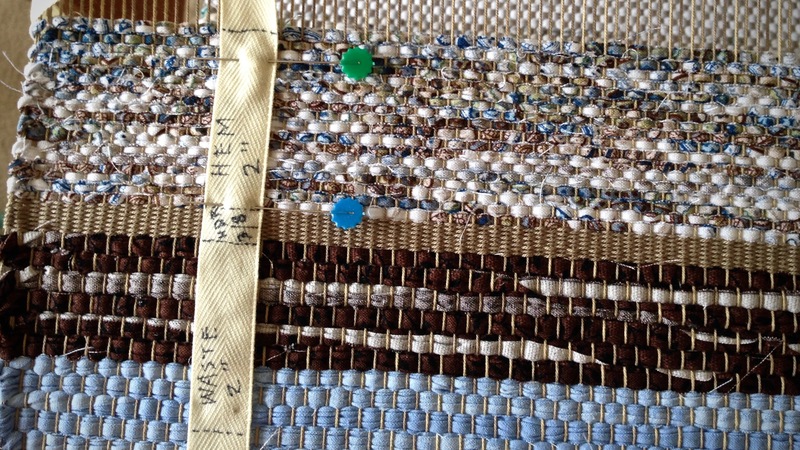 The purpose of the scrap weft is to hold the weft of the rug in place. 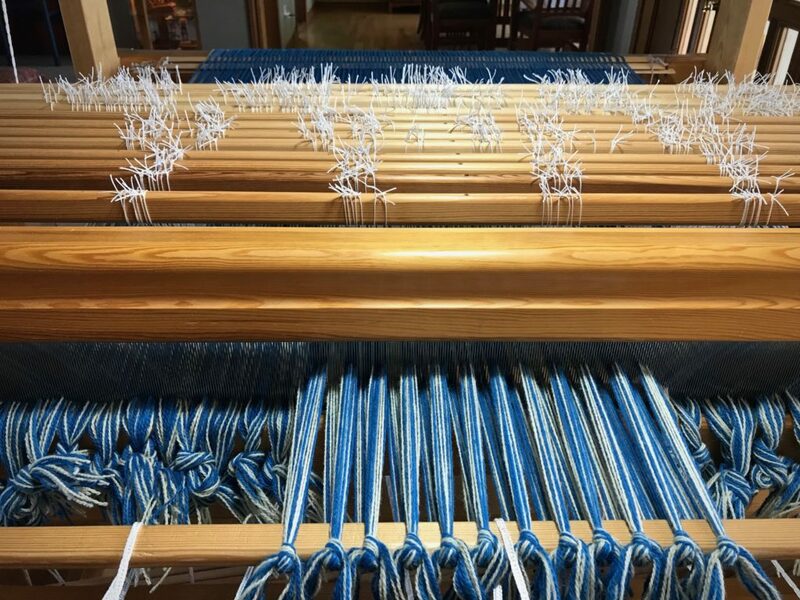 The scrap weft is removed a little at a time as I tie the warp ends into knots to make the weft completely secure. Beautiful & glorious words, Karen! Merry Christmas from North Carolina! Hi Jill! It’s wonderful to hear from you! 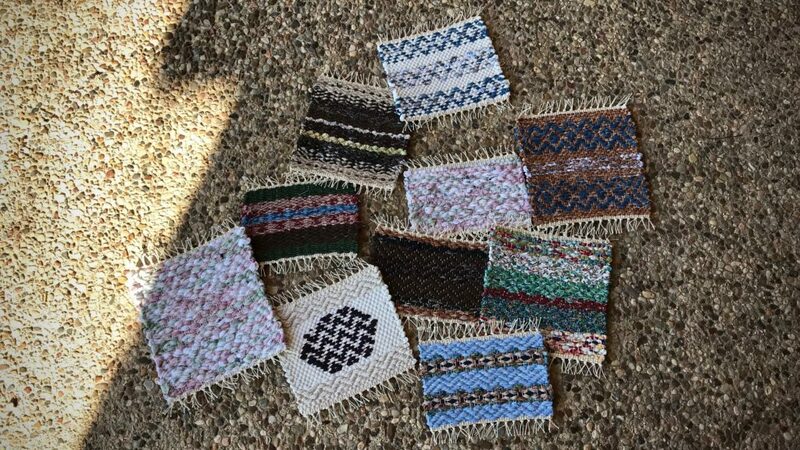 Please tell how I can get your patterns for weaving mug rugs, placemats, and pot holders..
Hi Norma, Thank you for asking. I will send you an email. I recently discovered your blog while researching swedish rosepath. Your weaving is an inspiration thank you for sharing your experience. 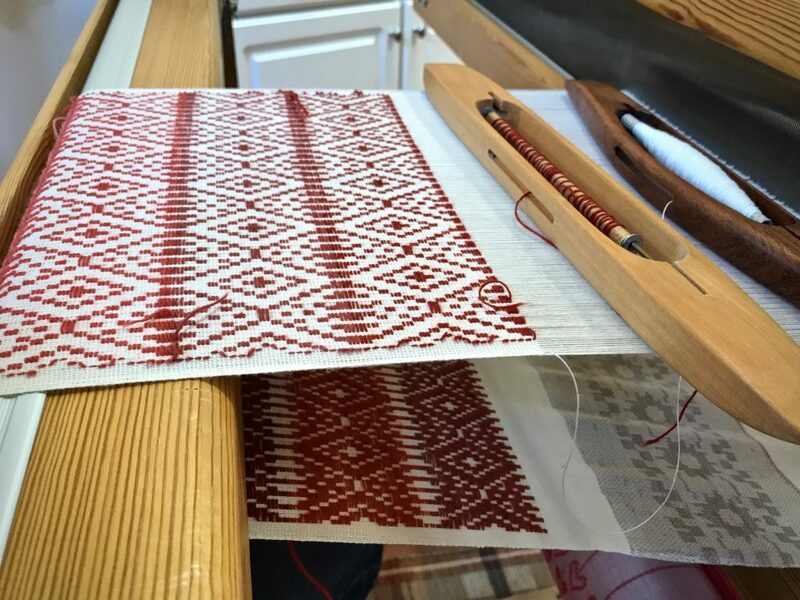 I am a self-taught weaver and have learned that rosepath can be woven as boundweave, on opposites or with tabby between pattern picks. Can you tell me how this pattern was woven and where I can find a draft? Hi Darcy, Rosepath was the thing that drew me into Swedish weaving practices. You will find drafts for rosepath (rosengång) in almost any Swedish rag rug book. The rosepath in most of these mug rugs is woven with tabby between pattern picks. A couple of them have just the rosepath, without tabby. Is there such a thing as too many handbags, pocketbooks, tote bags, and purses? Of course not. Naturally, my favorite handbags are made from handwoven fabric. Linings made from remnants, handwoven bands used for shoulder straps, hidden zippers, and, of course pockets–these are the details that other people will seldom notice. Yet these are the details that make me smile every time I use one of these bags. Nineteen handwoven handbags. Various sizes, fibers, styles, and purposes. And colors. Lots of colors! …You know that box of handwoven bits and pieces? Those weavings from the end of the warp, and the “scraps” from various projects? Hmm… looks like I might need to make another handbag or two. 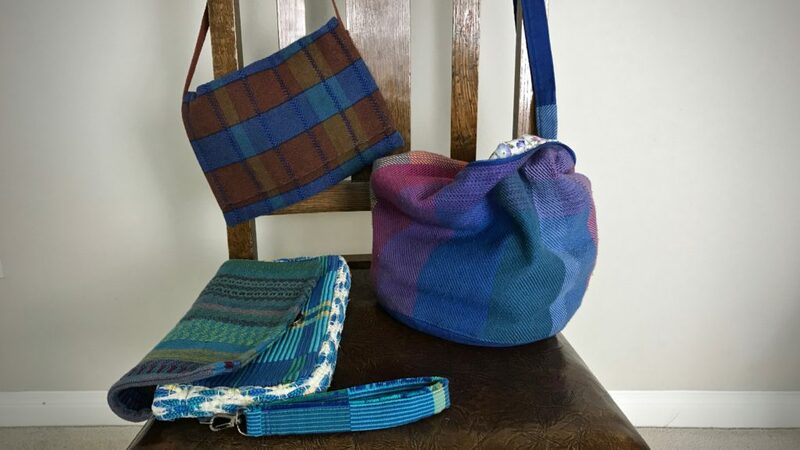 Here is my collection of handwoven handbags, divided into a few categories. Plus, a short video just for the fun of it! 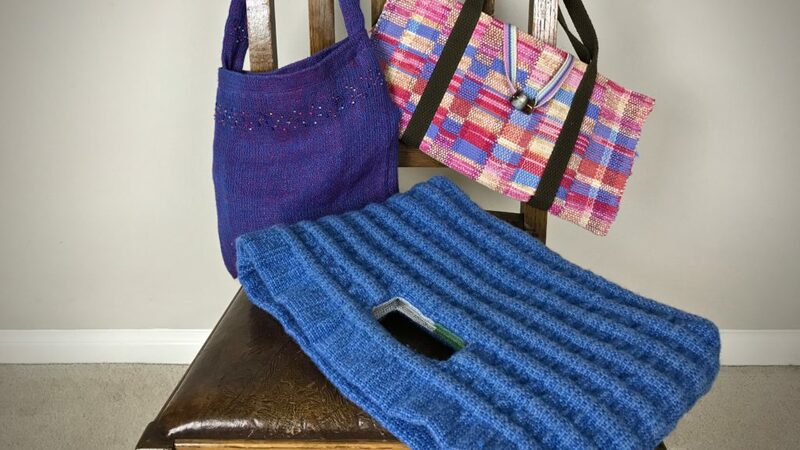 Wool, novelty chenille yarn, crochet cotton, and narrow fabric strips are used for weft in these bags. Buttons are from my grandma’s button jar. The small rag-weave pocketbook has a permanent home in my daily handbag. 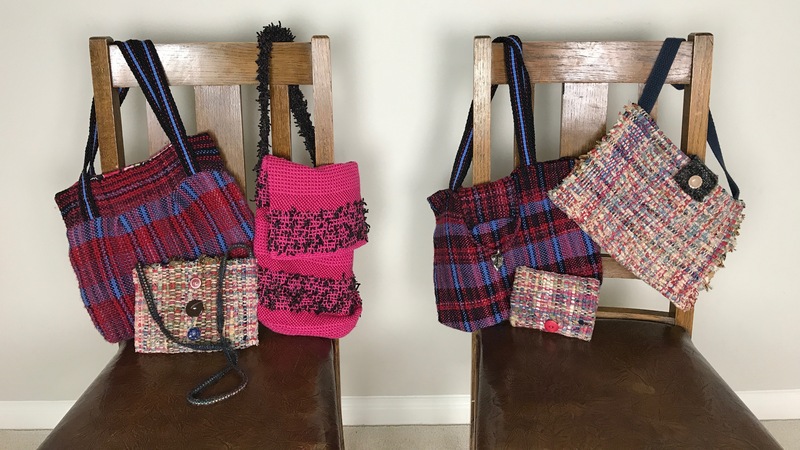 The fabric for these bags was woven on my Beka 32″ rigid heddle loom. Linings are from remnants of other sewing projects. 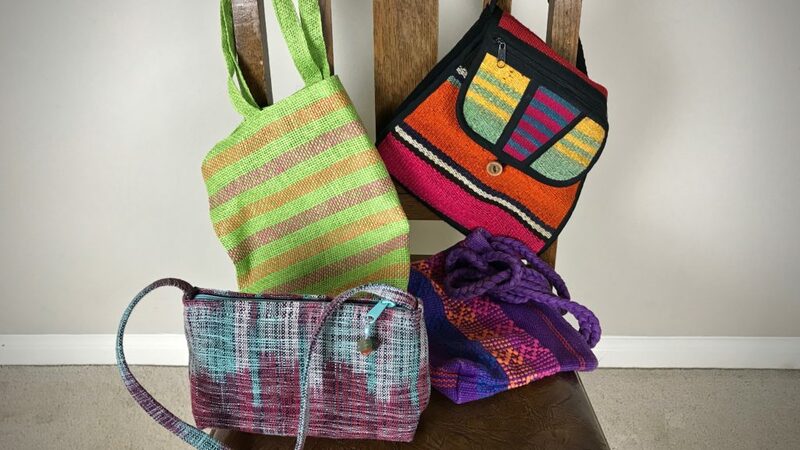 Bag handles were woven on my inkle loom. Trips to The Philippines yielded interesting woven goods by artisans there. The green stripe tote bag is woven from native plant material, and the teal and burgundy purse is a beautiful example of ikat weaving. The colorful weft-faced woven shoulder bag and the purple bag with lovely weft-float patterning came from travel to Chile. Large tote bag, woven with 1/4″ fabric strips for weft, carries my “show and tell” when I go to my weaving study group. 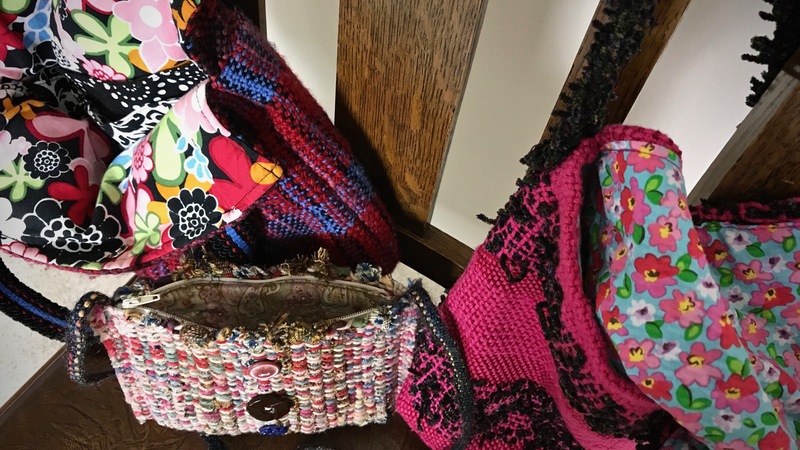 It’s known as the “Mary Poppins Bag.” Rag-rug bag in the center has straps, woven on the band loom, that were woven into the bag. This bag carries my portable tapestry weaving. 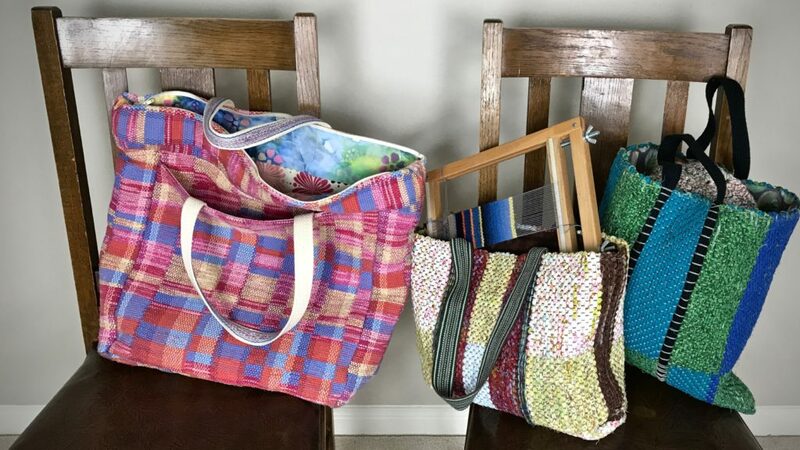 The rag rug bag on the right carries my one-and-only crochet project. Linen bag has beads woven into the fabric. It is lined with satin. Rag-weave purse is simply a flat piece folded in half, with lining and pockets added to the inside. 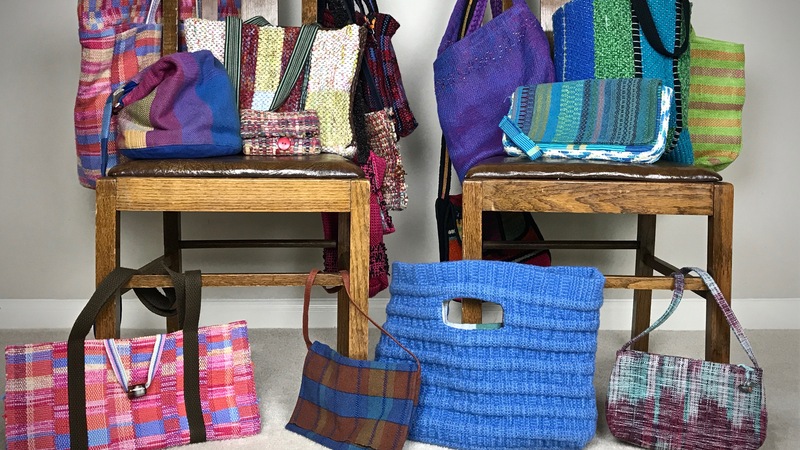 The blue bag is wool, woven in a weft-cord technique. The fabric was partially fulled to produce the ribbed texture. 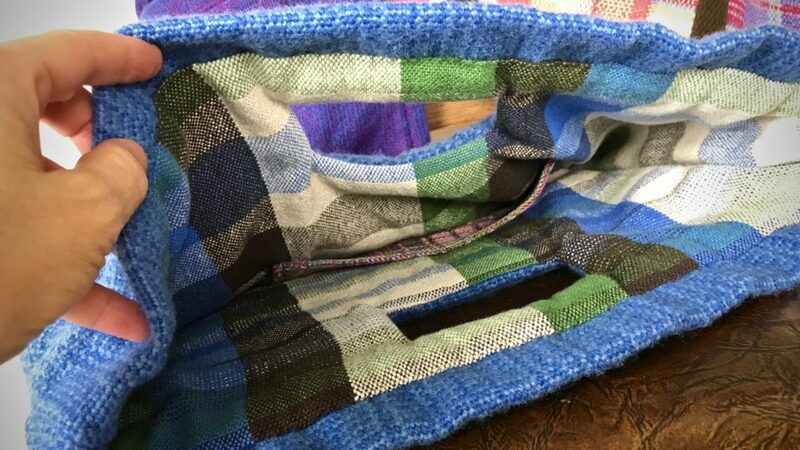 Lining for this bag is made from extra fabric after weaving cotton/linen fabric for cushions, and the pocket is a remnant from a two-block twill tencel scarf. Representing some of my “firsts.” The brown and blue small shoulder bag is from one of my first cottolin towel projects. This is what I did when the last piece was too short to use for a towel. The green and turquoise clutch has remnants of my first ever handwoven towel, my first rosepath rag rug, and my first big rep weave project! The blue shoulder bag is the bag I use every day. It’s a remnant from the baby wrap I wove for my daughter’s first baby. It’s lined with a remnant from an Easter dress I made for her when she was a little girl. May you carry your handiwork with you. Hi Mary Kay, I have found a few good commercial patterns for an assortment of bags. And I used Simplicity 2201 for the green and teal clutch. Other patterns that I have not used yet are Simplicity 9949 and Simplicity 2274. All of the patterns have multiples sizes and shapes of bags. There are probably some more good patterns out there now. I’ve had these for several years. I enjoy browsing the pattern books at the fabric store. For some of the bags, I folded and played with the fabric to make up a simple design. For the shoulder bag that I currently use all the time, made from the baby wrap remnant, I purchased a bag at the store that I thought would work well with handwoven fabric. I took it home and ripped out all the seams to deconstruct it. Then I had the basic shapes, which I reconfigured to exactly what I wanted. I made a practice bag first out of denim before using the handwoven cloth to make the final bag. It was so much fun to see all your beautiful bags, Karen! Nineteen is certainly not enough!! Hope you keep making more and sharing them with us. You have a wonderful sense of color! Hi D’Anne, You are so sweet! When I make another bag, you’ll be the first to know! 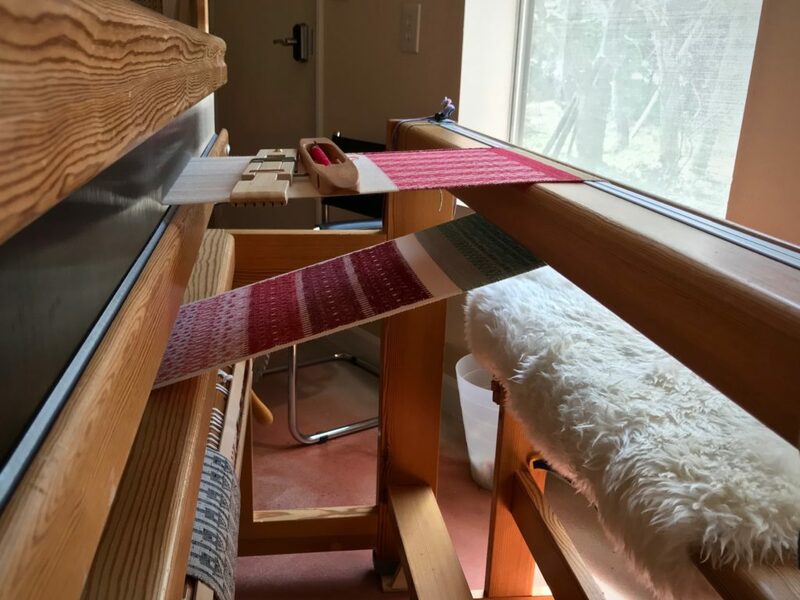 You had the icon to share to Facebook, so I shared this post with my Rigid Heddle Adventure group. They’ve been talking a lot lately about creating bags. Thanks for the post! Hi Cindy, That’s wonderful! 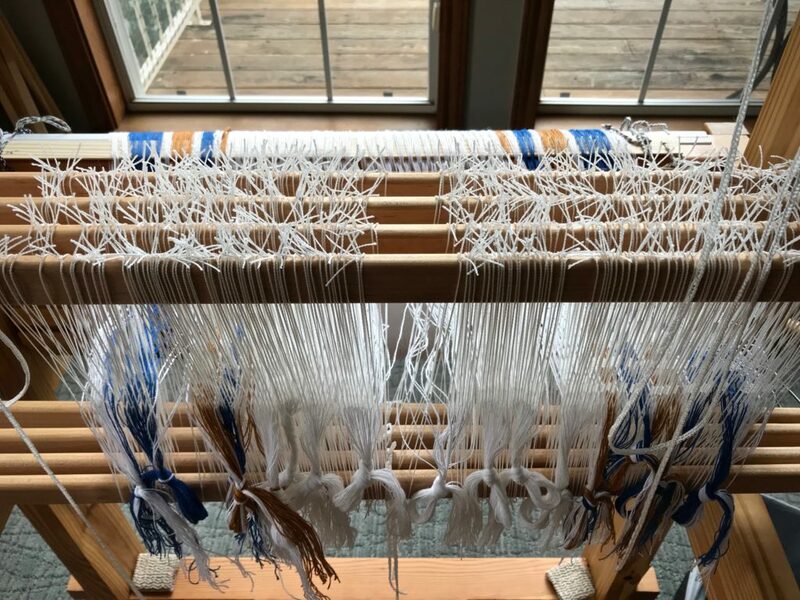 The rigid heddle loom is perfect for making fabric for bags because it’s so easy to use a variety of fibers in the warp and in the weft. It’s a fun adventure! Good morning, Angela, You are very kind! Please quote me a Magazine for which I wish to submit and an article dealing with woolen durrie weaving. Hi Kantilal, Thank you for asking. I don’t know a magazine that has an article about woolen durrie weaving. 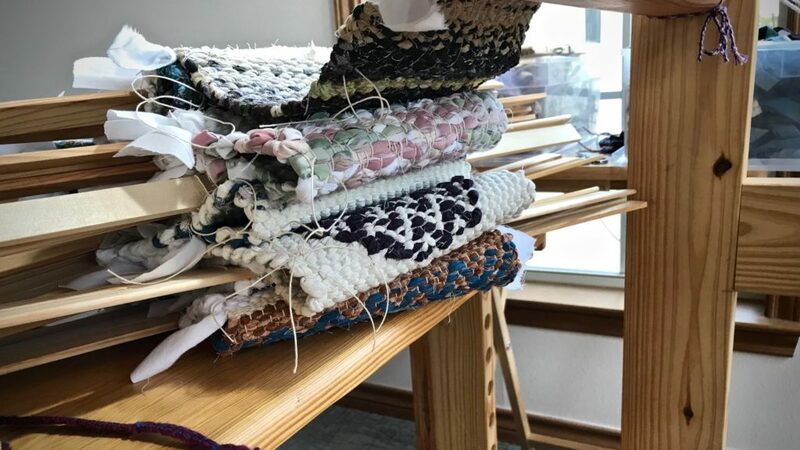 “Väv” magazine sometimes has articles about different types of rug weaving, and “Handwoven” magazine sometimes has articles about rag rug weaving. The March/April 2017 issue of “Handwoven” has instructions for a “Swedish Rosepath Rag Rug” that I designed. I had a visitor this week. You might be surprised to see what a seven-year-old can do. Young Jamie picked out her colors, wound fabric strips on the ski shuttle, and wove a small rag rug. Almost all by herself! She helped me advance the warp, and remove warping slats as they came off the back beam. After twisting the weft at the selvedge, Jamie angles the weft in the shed before beating. 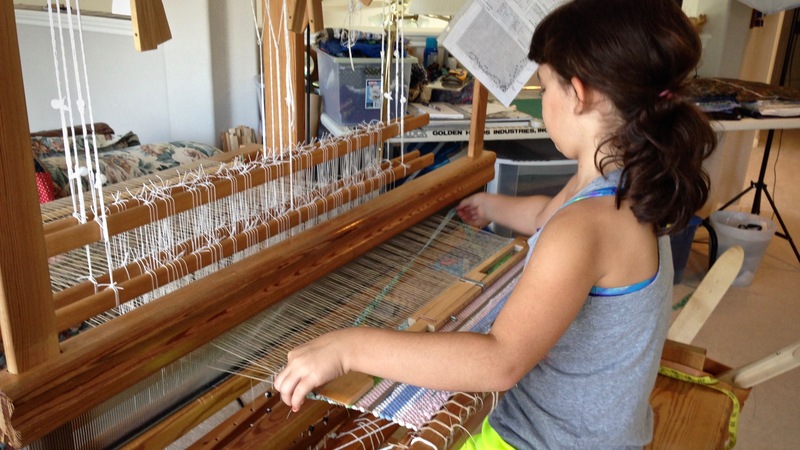 And this seven-year-old has plenty of strength to pack the weft in tightly with the beater. It was rewarding to see my little friend catch on so quickly. She believed me when I told her she could weave a rag rug; and she trusted me to show her what to do. Weaving was a success because Jamie listened well, and followed my instructions. After she left, I wove the warp thread header, cut the rug from the loom, and tied the knots, leaving fringe. Now Jamie has her own little handwoven rag rug! Warp ends are secured with overhand knots. The fringe adds a playful touch to Jamie’s first rag rug. Trust in God is a bold thing; it is confidence in God through all of life’s challenges. Beware of anything that tempts you to question your trust in God. He comes beside us and faithfully guides as we walk through life. God is someone we can trust. When we listen well and follow instructions, he weaves something good through our hands. I so enjoyed this message! Your young friend will have a memory to cherish. Kris, It’s always a pleasure to pass on what we know to a younger generation. It is not enough to be pretty; a good rag rug must also be sturdy. Four crucial steps give a rag rug the solid foundation it needs to get off to a great start, and to be ready for the strong beat required to make a rug that lasts. 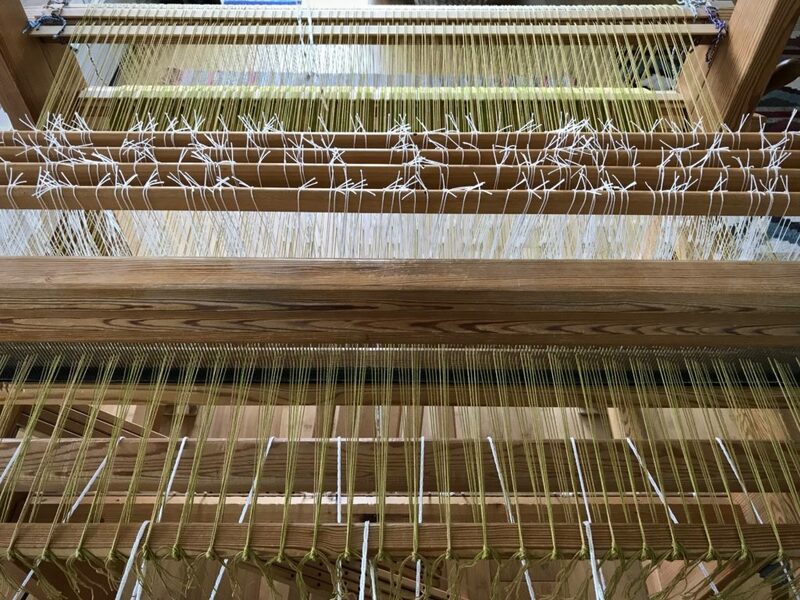 Empty warp is followed by a pair of warping slats, scrap weft, warp yarn header, and beginning of hem. 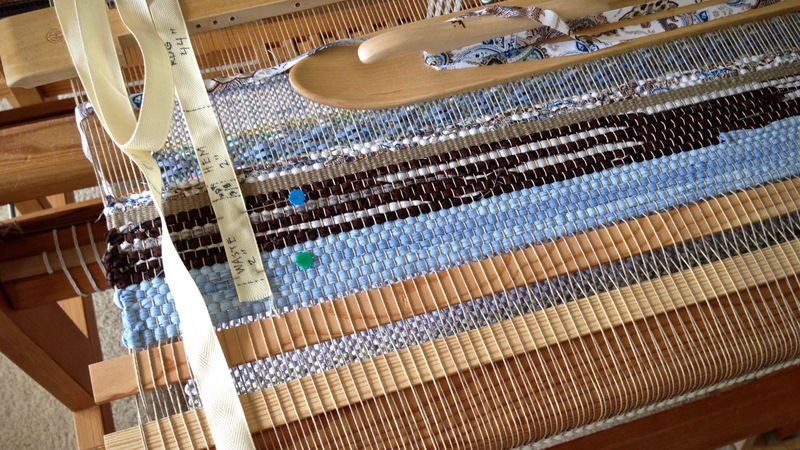 Measurements are marked on twill tape for reference while weaving. Weave with scrap fabric strips, 1 – 2″ (2.5 – 5 cm) wide, for 2″ (5 cm). Attach the temple as soon as possible. 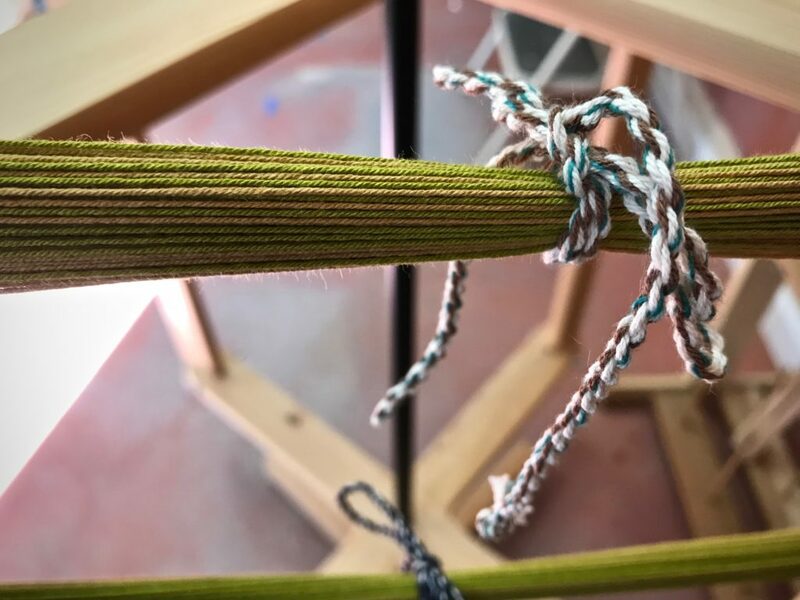 Use warp yarn to weave a 3/8″ (1 cm) weft-faced header. Arrange the weft in small arcs across the width of the shed. Treadle the next shed and beat in the weft. With temple in place, the header is woven with 12/6 cotton, the warp yarn. 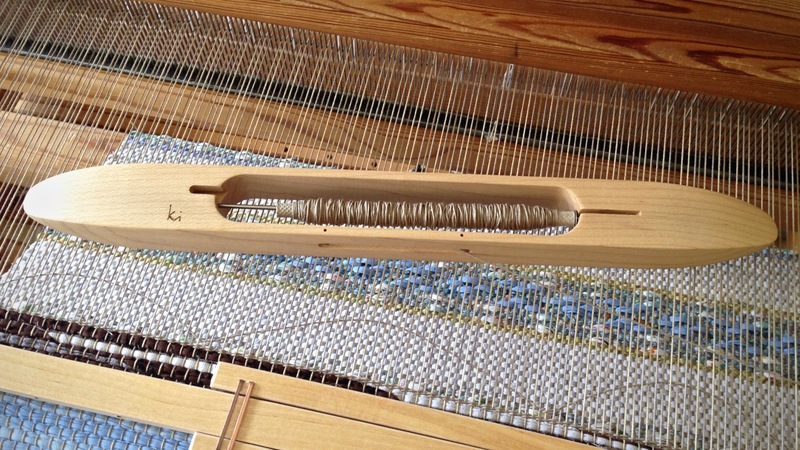 Forming small waves in the weft places more weft in the shed, which helps prevent draw-in. Cut fabric into narrow strips, 1/4″ (.5 cm) wide. Weave hem to desired length, with enough to fold under itself for finishing. Ready for the body of the rug! A good, strong beat will not disturb this layered foundation. It takes courage to live by faith. Courage is the backbone against which life circumstances can push. Faith is knowing God has a higher purpose for the circumstances we find ourselves in. 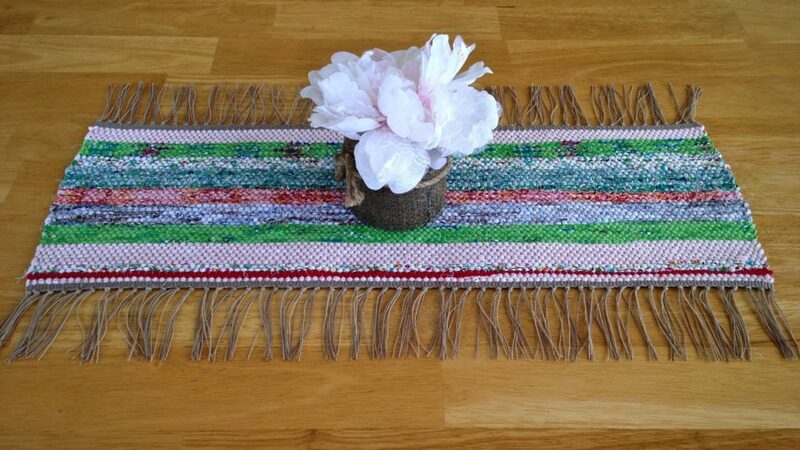 A rag rug with this firm starting point will not only look good, but be ready for a purpose. And so will we. This is a very timely post for me. My rotary cutter arrives on Tuesday and I am planning my very first rag rug. I finally have a Toika Liisa up and running so can undertake to weave something that requires heavy beating. Do you add any weights to your beater to get more sturdy rugs? Thanks so much for taking the time to explain, photograph and film. Your posts are a great read and so much more than just showing your achievement. Much appreciated! Looking forward to seeing your rug finished (and mine started)! I’m excited for you and your new adventure with rag rugs! I do not add weights to my beater. I can get a very strong beat with my overslung beater, because of the natural momentum in the swinging beater. Thanks so much for the post. May I ask what end per inch are you using? 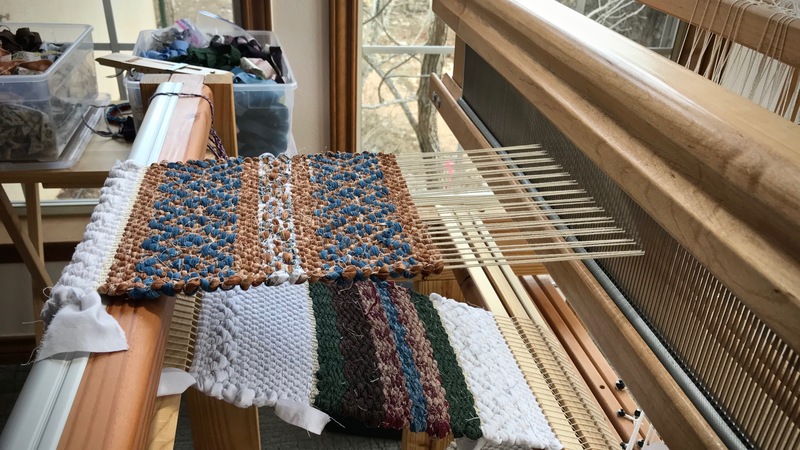 Thank you for sharing your techniques for weaving rag rugs and increasing my knowledge and excitement for weaving rugs. I had not thought of using narrower rags for the hem – I’ve always used coordinating yarn. Your rag technique will be used on my next rug. I am looking forward to seeing your finished project along with any tips you have for finishing your hems. 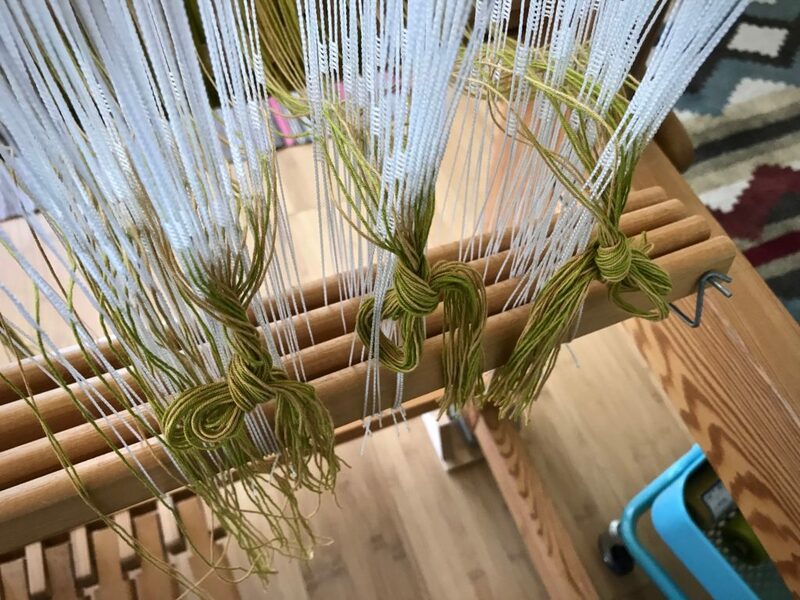 Several people I weave with use glue and/or another adhesive to secure the warp ends in addition to the knots they tie before the hem is sewn down. I’m curious to learn of your techniques. Blessings! When you take the rug from the loom, the weaving is quite vulnerable, so I understand why some people would use glue to secure the ends. The scrap weft will begin to fall out almost immediately, so you do have to be careful. I try to do the finishing as soon as possible, and remove the scrap weft only a little at a time. You may be interested in two posts, which include videos, that explain my finishing techniques. Tools Day: Rag Rug Finishing Video and Rickrack Rag Rug Hemming Video. Your videos are great. Thank you for sharing your techniques and for taking the time to respond to my comment. This post is so timely. I don’t seem to get sturdy enough weaving. I do not know if my weft is too thin or I am not beating hard enough. I weave on a Macomber which is a heavy loom. I’ve been using t-shirts for weft and now have some old sheets to dye and cut. How wide are your strips? I’m glad this post came at a good time for you! I cut my strips 3/4″ wide unless the fabric is very lightweight, in which case I cut them a little bit wider. I use only pre-washed cotton fabric. I’ve never used t-shirts or knit fabric for rugs, so I can’t tell you anything about that. 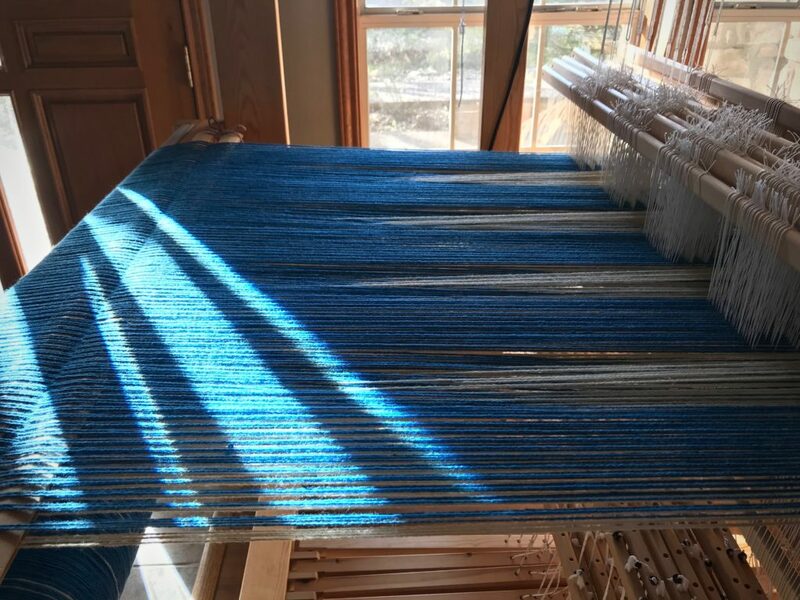 –Tight warp – I don’t know how much you can tighten the warp on your Macomber, but I keep the warp very tight on my Glimakra. 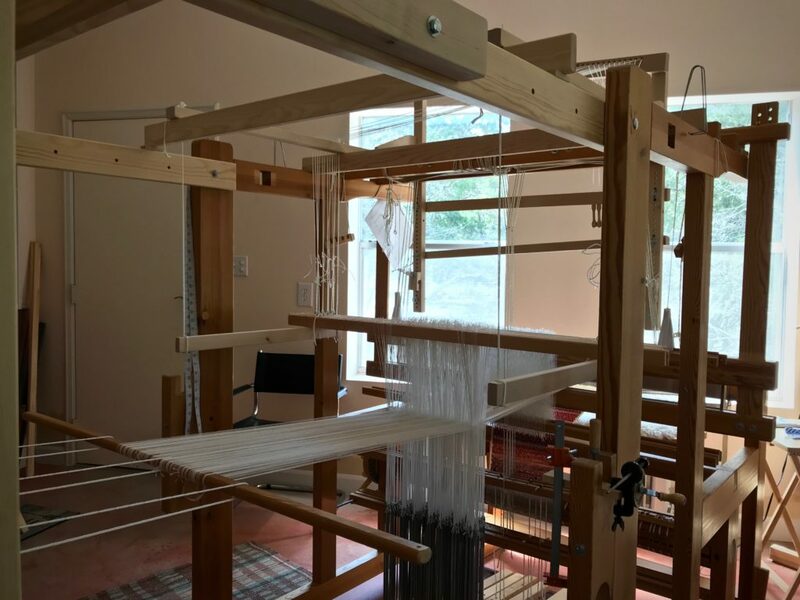 –Find the sett that works for your weft and your loom. My usual sett is 8 epi. If the weft is not packing in tight, you might try 6 epi. –Strong beat. I beat once with an open shed, then change sheds and beat twice. Some people add weight to the beater. I haven’t needed added weight with my overslung beater. –Make sure your selvedges are tight. Loose selvedges will weaken the entire rug. I twist the weft twice and pull it tight around the outer selvedge. –Use a temple. This helps with the beat and with getting tight selvedges. Many of my rag rugs are patterned weaves, like rosepath, which includes plain weave for the hem and between the pattern picks. When I twist the weft, I do not turn the ski shuttle around. By holding the other end of the weft taut I can easily straighten the fabric strip in the shed. I do not iron or fold the fabric strips at all. I cut them 3/4″ and lay them in the shed as is. Thanks so much, Karen! This is so helpful!